Setting the scene - a look at the historical and political context in which the Battle of Kurukshetra took place and the Bhagavad-gita was spoken. 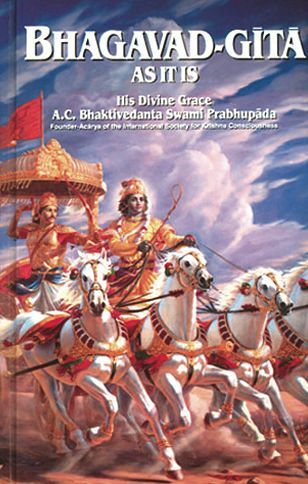 The Bhagavad-gita As It Is - the version of the Gita which has enhanced the spiritual lives of so many of its readers. Chapter Summary - a bird's eye view of the topics covered in the Bhagavad-gita. Read/listen/study - additional online resources for exploring this great literature. "The Bhagavad-gita is meant to show how one can understand his spiritual existence and his eternal relationship with the supreme spiritual personality and to teach one how to go back home, back to Godhead. . ."
"The purpose of the Mahabharata is to administer the purpose of the Vedas, and therefore within this Mahabharata the summary Veda of Bhagavad-gita is placed. . . the philosophy of the Vedas in the form of the Bhagavad-gita, is spoken by the Lord Sri Krishna. . . The Bhagavad-gita is the essence of all Vedic knowledge." "The Bhagavad-gita is the narration or the philosophy on the science of God, spoken by Krishna Himself. Srimad-Bhagavatam is the narration about the activities and transcendental pastimes of Krishna." "If truth is what works. . .there must be a kind of truth in the Bhagavad-gita As It Is, since those who follow its teaching display a joyous serenity usually missing in the bleak and strident lives of contemporary people." We're looking for audio and video on the Bhagavad-gita. Want to help? What's the special significance of Bhagavad-gita "As It Is?" Is the Bhagavad-gita historical or allegorical? On what basis do you accept Bhagavad-gita as truth? Does the Gita promote violence? Was the Battle of Kurukshetra seen as a "holy war?" What does Krishna mean in the Bhagavad-gita when He says "My devotees are never vanquished"? I just read the Bhagavad-gita and I'd like to know how one can achieve gravity and what "self-realization" means. What does Krishna mean in Bhagavad-gita (3.35) when He talks about "doing your own duty"?